The winner of The Apprentice 2012, and business partner to multi-millionaire business magnate Lord Alan Sugar, is Ricky Martin. Shortly after winning the Apprentice Ricky began work on the website for his new business with Designer Websites. The brief from Ricky was to design and develop a highly functional and very professional website to represent Hyper Recruitment Solutions. The website itself would specialise in science jobs, science and technology being a field of considerable expertise for Ricky himself. The website would fully integrate with their chosen recruitment software solution, to make managing and posting jobs on the website automated and easy. Ricky has worked in the scientific and technology recruitment industry for many years and is a well-known and respected recruiter in this industry, thus proposing this as his business plan was both clever and attractive to Lord Sugar. When we learned that Ricky wanted to work with Designer Websites to develop the HRS website we were most pleased and honoured. We immediately began work on planning and designing what we now feel is the best recruitment website on the Internet. The Apprentice, of course, is the wildly popular television programme in which aspiring young entrepreneurs battle it out for a chance to become a 50:50 business partner with Lord Sugar who would invest £250,000 in to their company. With Hyper Recruitment Solutions, Ricky Martin is aiming to provide a specialised, professional and highly compliant recruitment service for the science and technology industries. Jobseekers and employers alike will find the HRS recruitment website incredibly useful; applicants can find science jobs with some of the biggest names in the industry, while companies can use the website to recruit highly qualified candidates. 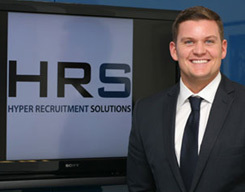 It’s a great deal for both parties, so whether you’re looking for employment or looking to recruit some talented new employees, Ricky Martin and the HRS recruitment website can help. We’re thrilled to have been given this opportunity – it isn’t often that you get to work with such high-profile clients. Apprentice winner or not, we think that Ricky Martin has come up with a brilliant business idea, and we know that he and Lord Sugar have worked hard to bring Hyper Recruitment Solutions to life. We’ve been working hard too, and we know that the HRS recruitment website that we’ve developed will be up to their high standards. The site went live today; you can find it at www.hyperec.com.